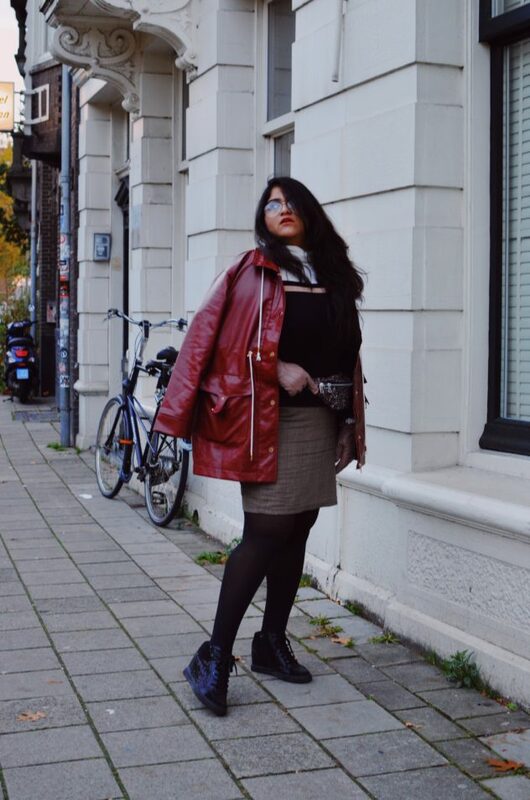 Home > Fashion > TrendWatch: 90s Leather Jacket is Back! TrendWatch: 90s Leather Jacket is Back! The oversized 90s leather jacket is back. No, not the biker jacket you’ve been sporting forever but the one with a boxy silhouette, buttons for zips, and statement collars. The bold colors from the autumn color palette make them look even more Carrie Bradshaw-esque and even touch the Rachel Green aesthetic! So, just for the sake of the fashion experimentation zone, I am in, I obviously had to go ahead and style it. And before you ask, it sure is a faux leather jacket. 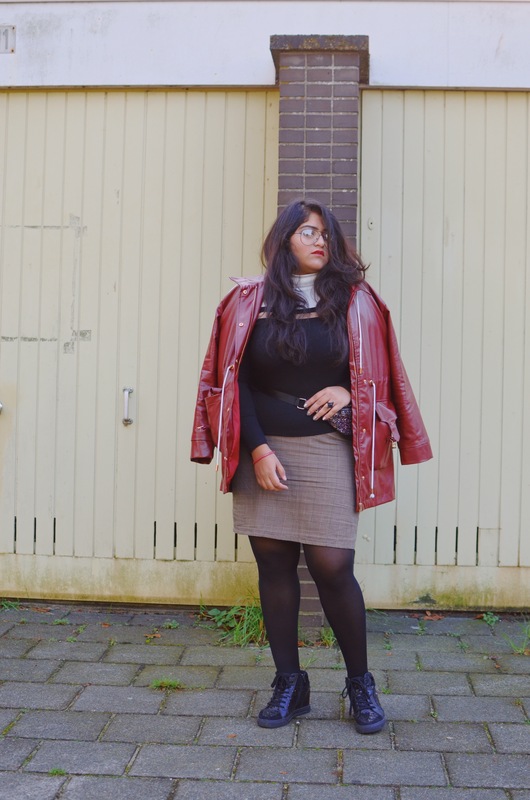 This 90s leather jacket is also a hit amongst the Autumn/Winter trends too. Honestly, I’ve lost count of how many fashion shows I’ve seen it in this season. In fact, I took the inspiration for styling my own from there, too. At this point, this mid-length 90s style jacket basically a must have for my wardrobe really. 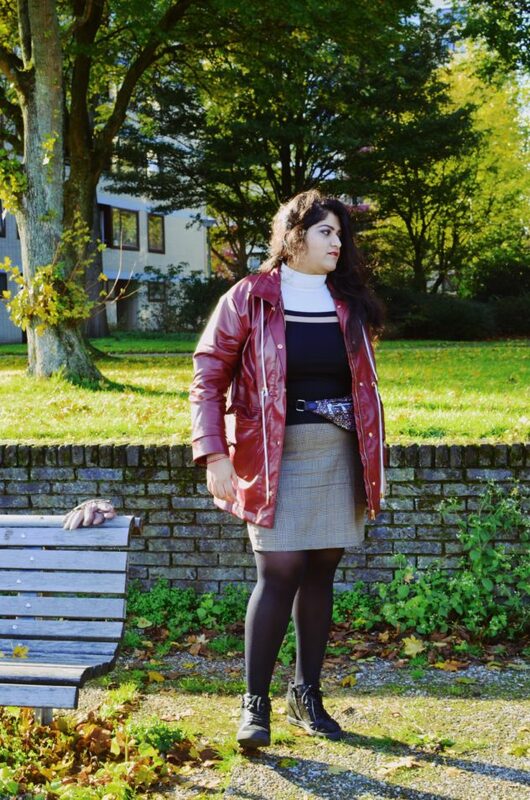 I took the chic 80s route when styling my 90s inspired jacket. 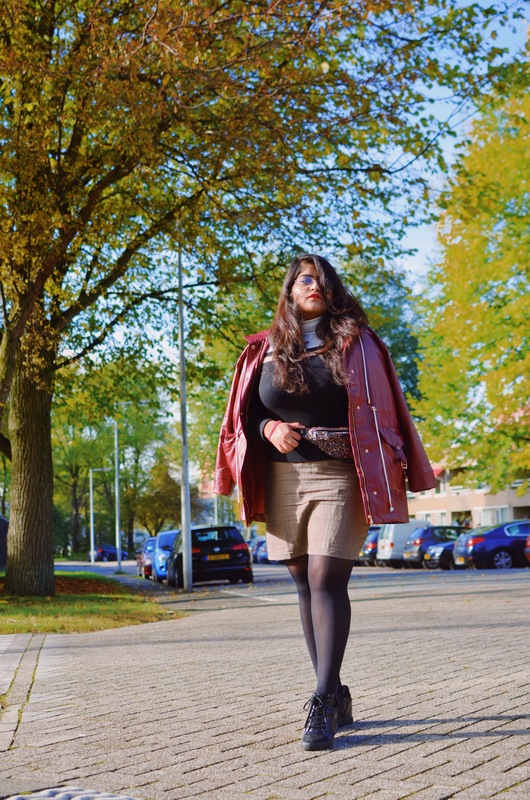 With a check pencil skirt and a turtleneck sweater in split stripes, I created a neutral pallet for my statement jacket. To add my own spin to the look, I added a belt-bag in glitter to compliment my choice. Of course, I also chose a rather classic color for my jacket but this piece from Shein is definitely warm and worthy of my recommendation. If you like the classy wardrobe, this is the kind of styling that you can easily get behind. No, I mean, you can wear a full leather suit and go straight to the 80s but for this style, it’s limited to coordinating matching tones of leather on the top and bottom, both. Add to your edgy-ness by going for a contrast bright, even neon-ish single tone wear underneath the 90s leather jacket. Yes! Best way to use your summer dresses for winter! I would probably not wear it for a long time to come, but, I do see a steep rise in bouge snake prints, too. You can go oversize and shorter with these and style them black fitted skirts to bring back the original 90s aesthetic. 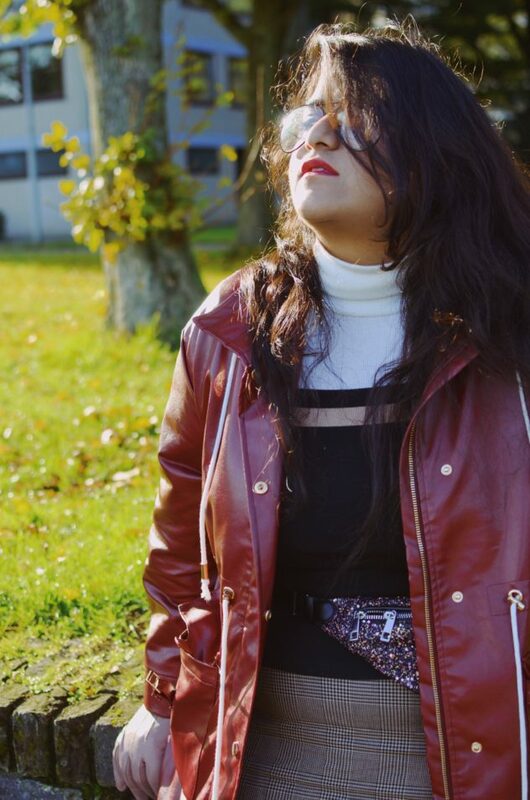 You can buy this oversized 90s leather jacket (faux) from Shein by clicking right here. (Shopping in India? Click here). It comes in a lighter beige color, too, basically perfectly aligned with our autumnal color tones for the season. I recommend styling it a little more classically for your daily wear with a turtleneck and leggings but not shying away from making a trend statement out of it either. If you do have other ideas about the 90s leather jacket trend and its comeback, leave it in the comments below. For more of my travel in style adventures, keep following ERTSY. Till then, stay chic, stay trendy!